After the minister pronounced the couple man and wife during their Reflection Bay golf course wedding ceremony, the bride and groom jumped over a broom what was placed in front of them. "Jumping the Broom" is a popular African American tradition at weddings, a symbol of sweeping away the old and welcoming the new life they are beginning, sweeping away all negative energy, making way for all things that are good to come into their lives. It also offers respect to the ancestors who came before them and paved the way. 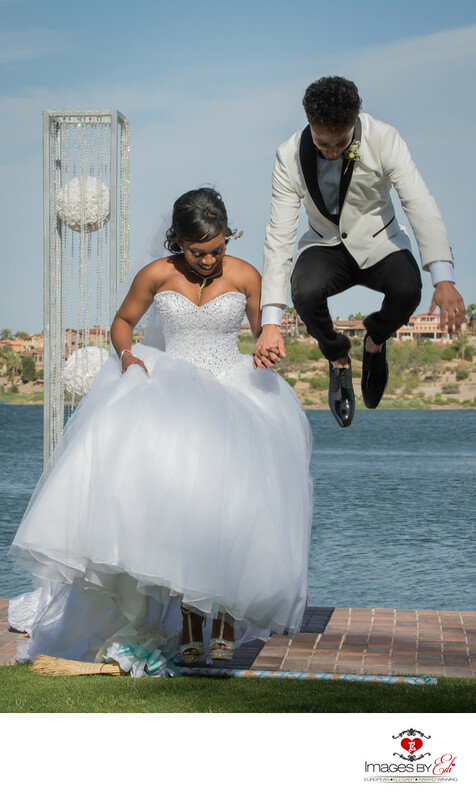 I really love this image as the couple, but especially the groom jumps really high and Lake Las Vegas offers a beautiful background for this tradition.